From Dr. Bryan Schuetz, Capital City Chiropractic in Columbus Ohio. A pinched nerve can cause severe pain. It can also cause pain to radiate or travel to the shoulders, hands, legs or feet depending on where the nerve is compromised along the spine and how severely it is pinched.There are many causes for this problem such as spinal misalignment, a bulging disc, arthritis, bone spurs, or even cancer in rare cases.The only way to find out what is causing your pinched nerve is to consult with a doctor who specializes in the treatment of these types of conditions. A chiropractor is a good choice to start. They offer conservative care without the possible side effects of drugs or surgery. Of course if your condition requires a referral to a medical specialist, your chiropractor can make a recommendation.We will discuss two of the most common reasons for a pinched nerve at this time. The first is when the spinal bones become misaligned and cause the disc to shift out of place and causing pressure on the nerve.The second reason we will demonstrate is arthritis in the spine and how it can cause a reduction in the room that a nerve has to travel from the spinal cord. 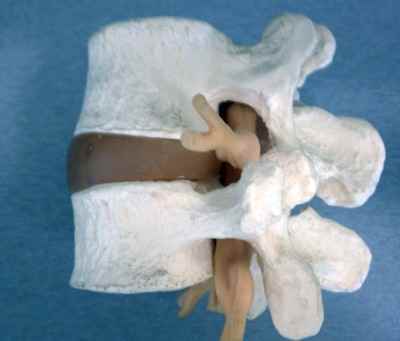 Below you will find models representing a spinal motion segment containing 2 vertebrae or spinal bones, the disc in between and the nerves exiting the spine. The first picture represents a normal motion segment of the spine. There are two bones with no bulging disc or arthritic changes in between. The nerve has plenty of room to leave the spinal cord and communicate with the body as it should. 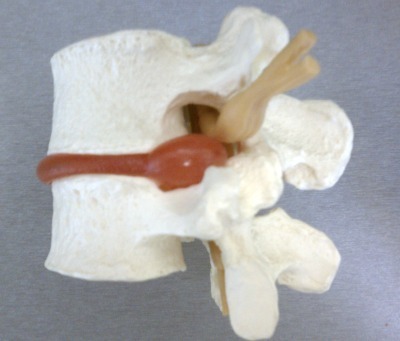 In this model we see the spinal motion segment with a big change in the disc. 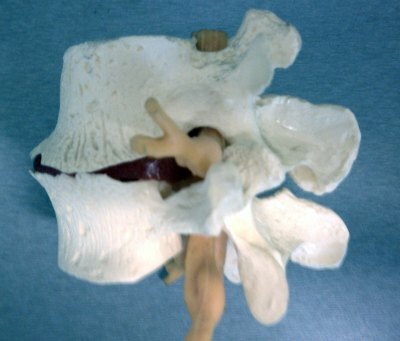 The bulging disc is closing off the area where the nerve leaves the spine (intervertebral foramina), and causing pressure on the nerve. In this picture we see that there has been a long standing misalignment in the spine that has lead to deterioration or arthritis. The disc wears out prematurely causing bone spurs and the space between the vertebrae to be compromised, causing pressure on the nerve. If you you like to have the cause of your pain evaluated in the Columbus Ohio Area, please call Capital City Chiropractic at 614-436-3870 24 hours a day for a free consultation with a doctor who specializes in spinal problems. If you live outside the Columbus Ohio area please Click Here for a doctor in your area.